A high fever is not by itself an illness. It's usually a symptom of an underlying condition, most often an illness or an infection. Although there are many non-infectious causes of fever, but a fever is one common symptom of a viral infection. A viral infection is a disease caused by one of many types of viruses: influenza (flu) is the most notorious. A viral infection can affect many different areas of the body–intestine, lungs, airways, etc.–but no matter what's infected, you'll often experience a fever. Other symptoms of a viral infection include headaches, runny nose, sore throat, hoarseness, cough, muscle pains, abdominal pain, diarrhea, and/or vomiting. 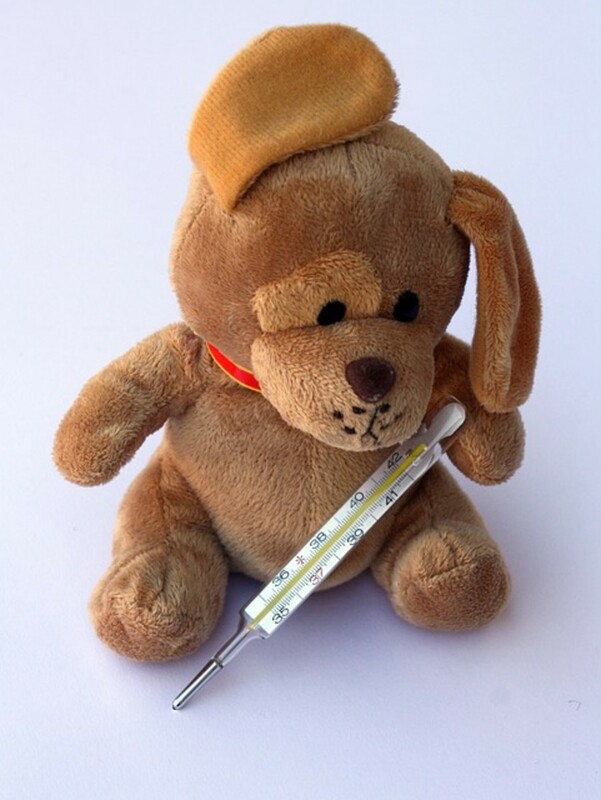 When you have a fever, it means your body's temperature has increased as a response to an illness or infection. Experts agree that fever is a natural bodily defense against infection, your body's way of "burning off" the infection. Antibiotics will have no effect on viral infections. Viral fever is a broad spectrum of medical conditions where viral infection is associated with marked elevations of one’s body temperature. 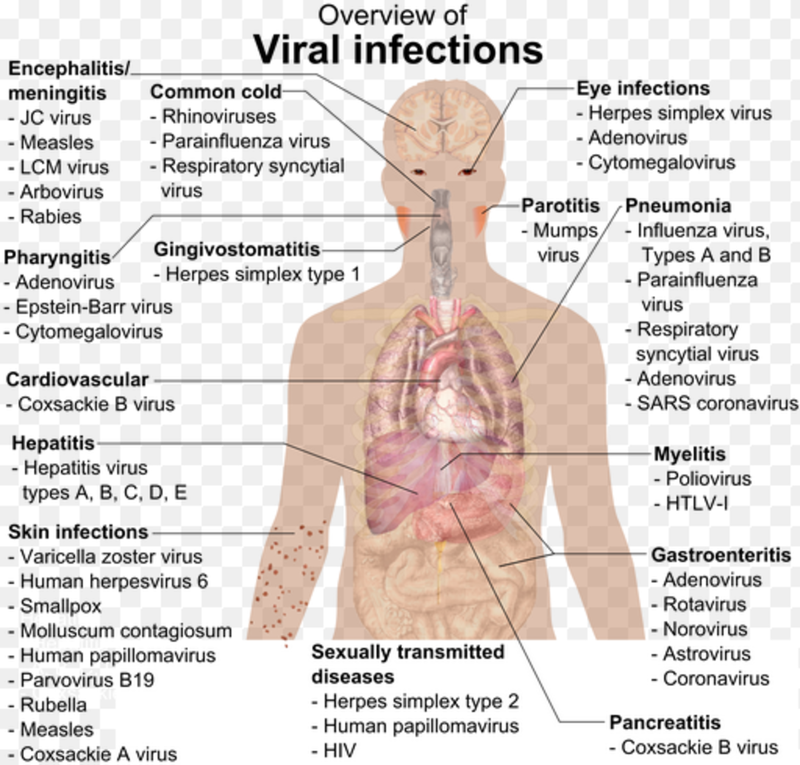 It encompasses a number of viral infections distinguished by their specific signs and symptoms. The infections may show generalized symptoms, but tend to affect specific body organs. Physical manifestations include body aches, headaches and skin rashes. Viral fever may affect any age group. The only cure is symptomatic treatment and some are known to be highly contagious. Most varieties are not dangerous, but some progress rather rapidly, causing them to have fatal results eventually. If you come down with a fever, it is a good idea to find out its cause by visiting the doctor and getting yourself checked. A virus spends some time incubating before the body shows symptoms, and one of the first signs of a viral infection is the chills, at which point it's a good idea to take your temperature. If the thermometer reads somewhere between 100 to 103 degrees F (37.77-39.44 C), then this may be a sign of a viral fever. Viral infections can spread by inhalation of aerosolized particles, by ingestion of contaminated food or fluid, or by direct contact. The infection initially spreads locally, then absorbed into the bloodstream or the lymph channels. Some viral infections can be transmitted via sexual contact or direct inoculation into an individual's bloodstream. The primary infection may last for days to several weeks. The clinical manifestation of the condition is generally a consequence of the virus growing on a specific area. Though there will come a time when the temperature goes down, there are cases when the virus continues to multiply, thereby causing more serious conditions. Once it enters your body, the virus has an incubation period wherein it multiplies at high levels, leading to an infection. Generally, fatigue and body malaise, coupled with muscle aches, follow, and this combination of symptoms often indicate the onset of fever. The resulting fever may either be low or high grade and characterized by fluctuations. There will be visible inflammation of the pharynx, nasal congestion, severe headache, cough and cold, muscle and joint pains, and eye redness. Your lymph glands will also most likely swell. The condition is generally self-limited, but the fatigue and cough may persist even after the patient's body temperature has normalized. This may take a few more days to weeks before healing is finally achieved. In extreme cases, complications may arise, including pneumonia, arthritis, diarrhea and vomiting. There are viral infections that can be spread via insects, such as the arbovirus. Its symptoms include bleeding, and may result to damage in the internal organs with fatal results. The accurate diagnosis and proper management of viral fever relies more on the clinical presentation rather than on laboratory tests. Lab tests are not necessary since the infections are generally self-limited. A diagnosis is made by going over the history of fever with severe joint and muscle pains. Doctors also look for inflammation of the lymph glands and skin rash. The only time laboratory investigations are ordered is when it is necessary to rule out possible bacterial infections. There is an increase in white blood cell count in bacterial infections, as well as a significant increase in the number of lymphocytes. There is no marked elevation of the ESR or Erythrocyte Sedimentation Rate. Confirmation is obtained from culturing the virus, through nasal swab or skin rash samples. An increase in antibody levels also indicates bacterial infections. Treatment will be symptomatic with the use of analgesic and antipyretic medications. Complete rest and increased fluid intake is necessary. Doctors may also recommend nasal decongestants. There is a specific antiviral therapy treatment, but that is not normally recommended by doctors except in extreme cases. Administration of steroids is not also recommended since this may result to bacterial "super" infection, in which case, antibiotics may be prescribed. Doctors make it a point to avoid using antibiotics for prophylaxis. Complications should be addressed immediately. Most cases of viral fever are completely cured within a week, though the patient may feel fatigue long after the fever has subsided. Prevention may be difficult since viral fevers generally occur as epidemics of infection, which depends on how the virus spread. Some vaccines aim to prevent gastrointestinal and respiratory viruses but you can't expect them to work as expected all the time, and you can't prevent infection with just one vaccine. Ailments caused by viruses are the most common causes of fever in adults. Physical manifestations include sore throat, hoarseness, cough, common cold, and muscle and joint pains. Virus may also cause other illnesses, like upset stomach and diarrhea. In most cases, these viral ailments will improve in just a few days, and there is no need to use any antibiotics. You can alleviate the symptoms with the aid of analgesics and decongestants. To alleviate diarrhea and vomiting, patient must increase liquid intake to help replenish lost electrolytes. If condition does not improve after 1 to 2 weeks of medication, consult the doctor. Influenza virus can result to more serious conditions. In some cases, this can lead to death. Symptoms are similar to the regular viral infection manifestations, like severe headaches and joint and muscle pains, accompanied by fever. Ant-flu vaccines have become available to help prevent flu. Case usually doubles during the winter months. Viral fever, being an acute viral infection, is a common occurrence when seasons change. Children tend to catch viral fever more easily since the virus can be spread when an infected person coughs or sneezes (with uncovered mouth) when around children. Just the same, if a child comes in with the hands of an infected person who recently coughed or sneezed, there is a great chance for the child to get the virus. The virus can also easily spread via the air ventilation system. A child who started manifesting the symptoms of viral fever is contagious for approximately 10 days, but the symptoms may continue for more than two weeks. Younger children (below 2 years old) are at greater risk of having complications due to viral fever. While viral fever comes in different kinds, children are only infected with the flu virus (influenza). If the condition is left untreated, it can result to more serious complications like pneumonia. Since there is no specific cure for viral fever, treatments are only designed for managing the symptoms that usually come with high fever, cough, and colds. The symptomatic medications can make your child feel better and comfortable, and also prevent further complications. According to doctors, children would initially have chills or fever ranging from 100° to 103° F. If your child can speak already, he is most likely to complain about body pain, particularly in the back and legs. Symptoms vary for different children, but there are specific ones that you have to watch out for, especially in those below 2 years old since most will just cry if something is hurting them. Flus and colds are just a couple types of viral infections. For babies, they need an annual vaccination, starting from 6 months up to 2 years of age. The flu vaccine can protect your baby against the most common viruses infecting children. This can also help prevent complications. However, doctors say that the flu vaccine only contains about 2 to 3 viruses only, thus, protecting your baby against these 2 or 3 kinds of viruses. He can still be infected with the viral flu if carrier has a different strain. The good news is, the flu vaccine produced every year for children's protection, is actually the flu strain identified to have been spreading for that particular year. This is the reason why flu vaccines are given on a yearly basis. Make sure you protect your child by not letting him stay around people who are sick. You may politely ask others to grab a tissue when sneezing or coughing to help prevent germs from spreading further. If someone in the household is suffering from the flu virus and exhibiting vomiting or diarrhea, it is important to practice good hygiene. Before picking up or carrying the baby, even if you do have the virus, make sure to wash your hands, and/or ask others who'd carry him to wash their hands first. Make sure that you wash your kid's hands with bacterial soap often, especially if he starts moving around and picking up anything he sees. Don't let him bring toys or anything he picks up to his mouth. Viral infections are quite common when seasons change. It is important that you are aware of this and take good care of your baby's health during these times. Constantly check body temperature - Use the digital type thermometer; it gives more accurate readings. Check initial temperature and record then check from time to time, ensuring that readings are recorded each time. A temperature reading of more than 97.8°F indicates fever. Be alarmed if fever doesn't go down despite providing medication. You may call the doctor if there is a steady increase in temperature, or it would be better to have your baby checked by the doctor to ensure that there is proper diagnosis. Check on the baby's clothes - Do not put on layers of clothes to your child. Most of the time, he may feel too warm if he becomes "over-clothed". Too much layering may lead to excessive warmth in the body, giving false diagnosis that he has fever, this is according to doctors. Before assuming that the baby has fever, check his clothes first. Prevent dehydration - Give him as much fluids as possible. He will lose a lot of body fluids due to the fever, vomiting, and/or diarrhea. If you are breastfeeding, feed him as often as possible. Ask the doctor for Oral Rehydration Salts (ORS); this will replenish the nutrients that your baby may have lost. It is safe to give your baby ORS though he is still breastfeeding. Feed with soft food - If your child is 6 months and older, you can give already feed him with soups or curd with sugar. This can help him recover. You can also add thicker foods, like mashed potatoes (or other vegetables) or porridge, when he starts to feel better, or ask his pediatrician for recommendations on what to feed him if he gets sick. Give the right medications - If your baby gets sick, it is best to bring him to the doctor right away, instead of trying to self-medicate. His pediatrician will be able to give proper diagnosis and the right medications to give your baby. Pain reliever may be given to ease the symptoms accompanying high fever, vomiting, diarrhea, and others. Proper rest - Let your baby rest. If you can, make sure that he can sleep undisturbed in a separate room. Most of the time, medications and a good rest help in alleviating the symptoms that will eventually lead to complete healing. Rest can also make him stronger, thus improving his immune system. Isolating him will also ensure that the virus will not spread to any other members in the house, especially if there are other kids. Make sure to lower the baby's body temperature - If he has high fever, aside from giving medications, you can also give him a sponge bath every now and then using lukewarm water. Doing so helps in making him feel refreshed, thereby helping in bringing down his body temperature. Make sure to wash your hands before touching or giving anything to your child - This also goes for other members of the household who will be helping you care for the baby. This ensures that the virus does not spread and will just be contained inside the room where the baby is staying. If there are other children in the house, tell them to avoid touching or going near the baby. Make him comfortable - Aside from ensuring that your baby is isolated in another room, make sure that the room well-ventilated. Turn off air conditioners or fans to make the chills stop. Avoid wrapping him in too many clothes. This can only make him feel more irritable than he already is. Make the bed (or crib) comfortable, as well. Your baby needs all the rest he needs to recover from viral fever. Further treatment - Consult your doctor if symptoms persist despite giving medications. He may give antibiotics. Let natural air flow into the house - Virus spreads via the air ventilation system. When someone is sick in the house, open the doors and windows at least once a day, to let fresh air to come in. This also aids in allowing the air to circulate properly. Make sure that you keep the house well-ventilated, clean and dry. Prevent molds as this may also be among the sources of virus spread. Though viral fever is not a serious condition, as it will heal eventually, it is still advisable to look out for signs of possible complications, especially since babies do not really say what ails them. Blood test - This is necessary in performing a complete blood count. If the white blood cell count is over 15,000/mm3, bacterial infection is present and the doctor may prescribe antibiotics as treatment. Blood test will also be helpful in diagnosing other forms of viral infection, like dengue, typhoid and malaria. Urine test - Fever also indicates urinary tract infection; hence, a urine test is necessary in making the proper diagnosis and prescription. Both viral and bacterial infections cause chills, fever and body malaise, but you can look for redness, pain and swelling in a certain part of the baby's body. These can manifest bacterial fever. Also, your baby may complain of sore throat. He may feel the pain on one side of the throat only. This is due to bacterial infection. His pediatrician may prescribe antibiotics to treat bacterial fever. As for viral fever, pain is simultaneously felt in several parts of the body. The body aches may be accompanied by fever, runny nose and cough. Doctors do not recommend antibiotics for viral infections, since they heal on their own. For viral infections, the treatment will be for the symptoms only. Fever. A viral infection may or may not cause a high fever, but a bacterial illness almost always causes a fever. Sore throat. A viral fever is usually the culprit if the throat is sore. The only common bacterial throat pathogen is streptococcus. The majority of sore throats, especially in adolescents and adults, are viral, but it takes a throat culture to make a reliable determination. Location. A typical viral illness involves wide-spread symptoms while a bacteria usually causes site-specific symptoms, such as those involving the chest, throat, or sinuses. A persistent earache may indicate a bacteria-based ear infection. Duration of illness. Most viral illnesses last from 2 to 10 days, but a bacterial illness will often last longer than 10 days. Mucus color. The mucus produced by a virus, if there is any, may be clear or cloudy, while a bacterial illness might cause yellow, green, brownish, or blood-colored phlegm. Contact with contaminated water, food, and surfaces. Contact in any way with infected pets, insects (ticks and fleas), and livestock. Latent infections that may not manifest through signs and symptoms initially, but may reactivate in a few months or years. Infection may be dormant for a while then manifests when the incubation cycle is completed. Both viral and bacterial infections have similar symptoms, like fever, coughing, sneezing, vomiting, inflammation, fatigue, cramping and diarrhea. However, viral and bacterial infections are different in many aspects, including structural differences of the organism-causing infections and their response to medications. Bacteria are single-celled with a rigid wall and thin membrane surrounding the fluid. They are relatively complex and are able to produce on their own. Bacteria can survive in any kind of environment, whether extreme heat or cold, radioactive waste and the human body. Most bacteria are actually harmless, and some are even called "good bacteria" because they help in the digestive process, fight disease-causing microbes, provide nutrients to the body, and fight cancer. Only about 1% of bacteria in the body can cause diseases in humans. On the other hand, viruses are even smaller in comparison to bacteria. Doctors say that viruses are even smaller than the smallest bacteria. A virus only has a protein coating and its core only contains either DNA or RNA. Viruses need a host to survive and can only multiply by attaching themselves to cell tissues. They usually reprogram the cells to create new viruses until these cells burst and eventually die. In some cases, they turn normal cells into cancerous ones. Not like bacteria, most viruses cause diseases and are specific as to what cells to attack, mostly targeting the blood, respiratory system, or the liver, and in some cases, they attack bacteria. Although a viral fever will not respond to antibiotics and will usually improve on its own after five days or so, it is still a good idea to go to the doctor. A fever that is left untreated is never a good thing. Some viral infections may worsen into pneumonia and other more complicated infections, and some infections you thought were viral may turn out to be bacterial. The surest bet when treating a fever is to have a medical expert check you out. Swing by your doctor's office or clinic just to be sure if what you are experiencing are viral fever symptoms or not. Once it is clear that a viral infection is the source of your fever, then you'll know what to do about it. Once your doctor has performed tests to determine that your infection is indeed viral, there are many home remedies and over-the-counter medications to help. Take a bath: Soaking in a tub of lukewarm or cool water may help you feel better. Control the heat: Lower the room temperature via thermostat or by opening a window. Keep a warm blanket close by in case you have chills. Use the blanket instead of difficult-to-remove items of clothing to self-regulate the temperature. Eating cold food might also help: popsicles, cold yogurt, and/or applesauce. Drink lots of liquids: Water or clear liquid is best (chicken broth, juice, uncaffeinated tea). The anti-oxidants found in most fruits might also help, and if there's vomiting or diarrhea, a drink with electrolytes might help. Herbal teas and ingredients that aid fever reduction include catnip, echinacea, elder flower, eyebright, feverfew, honey, lemon balm, lemon peel, lemon verbena, lemongrass, peppermint, pleurisy root, purpurea leaf, sage, stevia leaf, and yarrow. Lemon socks: Squeeze out the juice of one lemon into a cup of hot (but not scalding) water. Soak a pair of thin cotton socks in this lemon water, squeeze out the excess liquid, and put on the socks. Pull a pair of thick woolen knee socks over the lemon water-soaked socks so that you don't get your sheets wet. Keep the two pairs of socks on all night. Hot and cold socks: First, prepare one basin of hot water and one basin of ice cold water. Next, soak a pair of thin ankle socks in the cold water. While you're doing this, soak your feet in the hot water for a minute. Then, towel off the excess water and put on the socks that were soaked in cold water. Wear another pair of socks over the wet socks to protect your sheets. Keep the socks on for several hours. Damp washcloth: Soak a washcloth or face towel in lukewarm water, squeeze out the excess water, and for 10 minutes, pat the cloth or towel gently from your elbows down to your hands and from your knees down to your feet. This works by pulling the heat away from your core and from your head, where excessive heat can harm your organs, on to your limbs where it is then released through the pores. Lemon: Slice a lemon (or other citrus fruit) in half and rub one half all over the soles of your feet. You may also use socks to keep slices of lemon against the soles of the feet overnight. 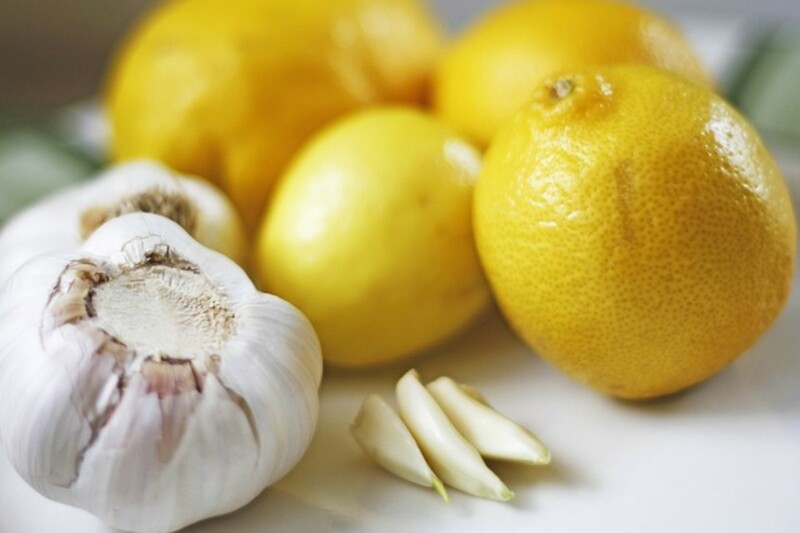 Garlic: Crush, puree, or slice up a clove of raw garlic and eat it. You can mix it with honey to make it more palatable. Garlic and olive oil: Crush 2 garlic cloves and mix them with 2 spoons of olive oil. Warm the mixture up a bit before applying it to the soles of your feet before covering with a plastic wrap overnight. Vinegar: Add half a cup of vinegar to your bathwater and soak in it for at least 10 minutes. Potato and vinegar: Soak a few slices of potato in vinegar for 10 minutes then place them on your forehead topped by a washcloth or small towel. Raisins: In half a cup of water, soak a handful (about 25) raisins. After a while, crush the raisins with a spoon to mix them with the water. Then add the juice of half a lime, strain, and drink this concoction twice a day. Herbal teas: Lots of herbs can be steeped to make teas that are beneficial against numerous medical conditions, including viral fever. You can do a combination of self-medicating with over-the-counter remedies and using natural means to relieve your fever. The most important thing, though, is simply to rest. Preventing viral fever is difficult. You never know when or if you're being exposed to a virus, and sometimes you don't know you're sick until it's too late to protect others. What you can do is avoid other people if you feel unwell. Washing your hands frequently will prevent you from spreading the disease through physical contact or by leaving traces of the virus on things like doorknobs. Another way to control its spread is by covering your mouth and nose with a face mask. If you don't have one, the least you can do is to cover your mouth with your elbow when sneezing or coughing. Never use your palms to cover your mouth as you will just transfer the virus to your hands which will make it easier for you to transmit it to someone else. Use the inside of your elbow when covering your sneeze and cough. Those who are infected with a viral fever, especially children, should stay inside your home for about ten days. If you notice someone showing viral fever symptoms, stay away, wash your hands, and cover your mouth. It may help to get the flu vaccine. The vaccine’s ability to prevent flu is not guaranteed, can range widely from season to season, and depends on the similarity or "match" between the flu viruses that particular flu shot is designed to protect against and the flu viruses spreading in your community. The vaccine’s effectiveness also varies greatly depending on who is being vaccinated. For young and old people who are at greater risk, for those who work with the public and those with weakened immune systems, the flu shot might be a safer bet. To wrap up, viral fever is the result of an infection caused by a virus. 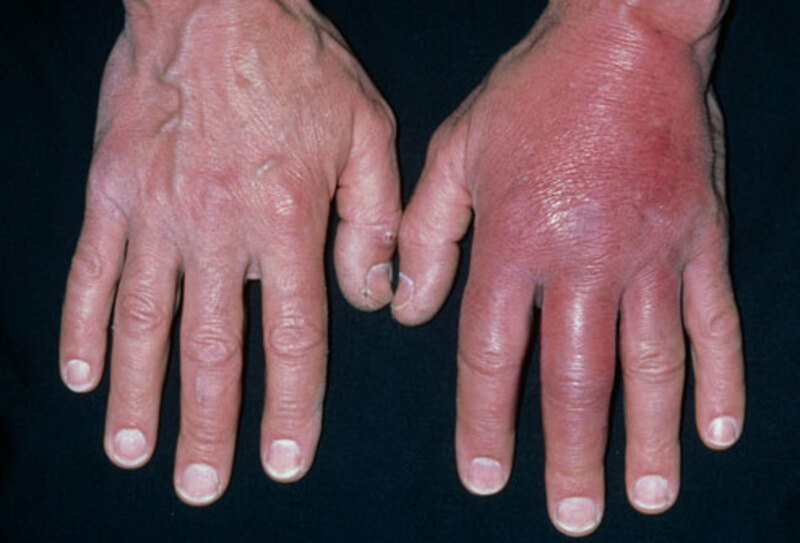 This infection becomes evident when certain viral fever symptoms start revealing themselves. Once you get the idea that you may have viral fever, ask your doctor for advice and then proceed to do self-treatment. Illnesses causing vascular damage as a result of symptomatic bleeding are collectively referred as VHFs or Viral Hemorrhagic Fevers. These are conditions that are transmitted from animals to people, or zoonotic ailments. They are usually found in arthropod vector, like spiders, insects and crustaceans. VHFs are associated with particular species and are normally contained in geographically isolated areas. However, if the virus is accidentally introduced to humans, the virus will be considered widespread. They can be transmitted from animals to animals. Humans get infected if they come in contact with infected saliva, feces, urine and other body fluids. Person-to-person transmission is also possible. Some of the symptoms of viral hemorrhagic fever are similar with the regular viral fever. These include fever, weakness, fatigue, dizziness, and muscle and joint aches. Some patients manifest bleeding under the skin, the internal organs, or other body openings, like the eyes, ears and the mouth. Some patients may develop diarrhea, accompanied by bleeding. Patients who are extremely affected will most likely suffer from seizures, delirium, kidney failure, and coma. In some cases, it can lead to death. Viral hemorrhagic fever is a term used to describe a severe multi-organ syndrome. VHFs are caused by different types of viruses. Typically, the whole vascular system of a patient is damaged, and the ability of the body to heal itself is impaired. The symptoms are accompanied by hemorrhage, but the bleeding itself is not serious. Some of these hemorrhagic viruses cause only mild ailments, but others also cause life-threatening conditions. They are all RNA viruses, meaning their genetic information is in the form of ribonucleic acid. They all have a protected coating, the fatty lipid. Their survival depends on the host's natural reservoir. These viruses are geographically restricted to areas where the host live. Humans have no natural reservoir where these viruses can "reside". People are only infected by the viruses upon contact with infected hosts. It has to be noted, as, well that when viruses are transmitted to humans, they, in turn, can cause the spread of the virus among other humans. As a result, that one person who was infected from the animal host, becomes the human host of the virus that will cause an outbreak to happen. However, it is hard to predict outbreak occurrence. There are no known cure or drug treatment for viral hemorrhagic fevers, though. As mentioned earlier, all are zoonotic viruses. They depend on their animal hosts to replicate and survive. In general, rodents and arthropods are the primary reservoir for these viruses, including the house mouse, deer mouse, cotton rate, and other rodents. Mosquitos and arthropod ticks are the vectors for these ailments. However, the hosts of some viruses are unknown, examples of these kinds of viruses are Ebola and Marburg. The virus-causing VHFs can be found in any part of the world. Each virus is associated with specific animal host species, both virus and disease are normally seen in only one specific host species. However, some hosts, like rodents, carry different kinds of new world (tacaribe complex) arenaviruses, and are restricted in the areas where they are found. The spread of the viruses is restricted in these areas. Other hosts are distributed over different continents, for instance, rodents carry viruses that cause different forms of HPS or hantavirus pulmonary syndrome in North America and South America, or other rodents carry viruses that cause renal syndrome or HFRS Europe and Asia. A few more hosts are found almost worldwide, particularly the common house rat. People are normally infected in the areas where the animal host resides. Virus-causing hemorrhagic fever are initially transmitted to people when there is contact between infected animals and humans, whether direct or indirect. The viruses from rodent reservoirs are transferred to humans when they come in contact with infected urine, feces, saliva and other excretions. The viruses associated with arthropods can infect humans when a vector tick bites an individual, or when that individual crushes a tick or mosquito. In some cases, vectors transmit virus to other animals. In the case of livestock, the one who cares for or slaughters the animals with the virus gets infected. Other types of virus can be transmitted from person-to-person, once the original human host becomes infected. These viruses include Lassa, Marburg, and Ebola. This is referred to as secondary virus transmission, wherein an infected human comes in contact with another person, thus transmitting the virus. Viruses are also transmitted when a person comes in contact with contaminated items, like syringes, Ebola is known to have spread by reusing syringes and needles. Signs and symptoms vary, depending on the type of VHF. Initial symptoms are high fever, fatigue, body malaise, dizziness, extreme exhaustion and muscle aches. People with severe cases show signs of heavy bleeding underneath the skin and internal organs. However, there is bleeding from other parts of the body. Bleeding is not fatal, though. Still patients who are critically ill may also exhibit shock, delirium, seizures and nervous system malfunction, or worse, coma. Some types of VHF are also associated with renal failure. Patients who are diagnosed with VHF receive supportive therapy. However, in general, there are no specific or established treatments for the different ailments. Ribavirin, a known anti-viral drug, can treat people with Lassa Fever or HFRS. The treatment for convalescent-phase plasma is used for patients with Argentine hemorrhagic fever (AHF) or O'Higgins disease. Only yellow fever and AHF have vaccines. For other viral hemorrhagic viruses, vaccines are yet to be developed. Because of this, preventive undertakings focus on ensuring that people do not come in contact with host animals. Should the prevention techniques go awry and a case develops, the focus of medical practitioners is on preventing the virus from spreading to other humans. Promote proper cleanup of rodent homes and droppings. In the case of arthropod vectors, prevention is done by focusing on insect control for the whole community. Also, people are asked to practice the use of insect repellant, the use of bed nets, installation of window screens, and other barriers that may fend off rodents from entering the house and prevent people from being bitten. For viral hemorrhagic fever transmitted from one-person-to-person, people should avoid physical contact, like exchange of body fluids through kissing. Infection control strategies include putting individuals in isolated to avoid further spread of the virus. Medical staff handling infected patients should also practice maximum protection to ensure that they are not infected. Other recommendations include the use of disinfectant and proper handling of used medical items and equipment, like thermometers, needles, and masks. The reported cases in the US are those that were infected when they traveled to regions known to have virus carriers. However, researchers are seeing an increasing risk in the Texas-Mexico border and other southern areas. A dengue outbreak was reported in 2009 in Key West, Florida. A person will be infected if bitten by an Aedes mosquito carrier. The mosquito actually gets infected when it bites another human with the dengue virus. The virus cannot be transmitted directly from person to person. Most of the symptoms are similar to the common flue or other viral infections; hence, some patients are not accurately diagnosed immediately. People who have not had the infection and younger children may show milder cases unlike older children and adults. Complications of dengue hemorrhagic fever may arise. 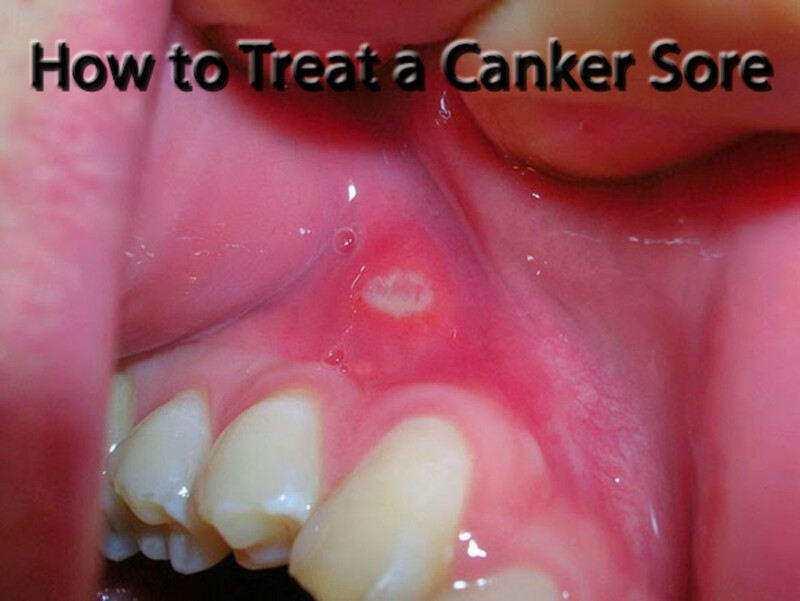 This is characterized by unusually high fever, damaged lymph glands and blood vessels, enlargement of the liver, bleeding in the gums and nose and circulatory system failure. The systems may progress into excessive bleeding, shock, and eventual death, a condition referred to as DSS or dengue shock syndrome. People with a weak immune system and those who have previously suffered from dengue fever have a higher risk of contracting dengue hemorrhagic fever. There is no known specific medication for treatment. Doctors may recommend pain relievers like acetaminophen, but taking aspirin is not advised as it can worsen the bleeding. Enough rest, more fluid intake and doctor consultation are necessary. If the condition turns for the worse during the first 24 hours, the patient should be brought to the hospital immediately to be evaluated for complications. To date, there is no vaccine that prevents dengue fever yet. The best recommendation is to make sure that the home is free from mosquitos, making sure that it is clean and has no stagnant water around. When travelling to any tropical area, it is imperative to take the necessary precautions and avoid being bitten by mosquitoes. Are You Facing any of the above Viral Fever Symptoms? Hope all will fallow this instead of going to doctor . Good article for humen bengs. Tq for providing information in depth and also for home remedies, it is very useful. Thank you soo much its very clear and very clean.. I am very thankful for ur remedies.Hope they work out. I am suffering from fever and pains(muscle and joint pains). hospitalized for 9 days. now i got cured but pains remained. may i know how much time it takes to get relief from muscle and joint pains.